Bookplate in Greek of Frederick North, fifth Earl of Guildford from a 17th-century work on Swedish church history by Johannes Baazius. 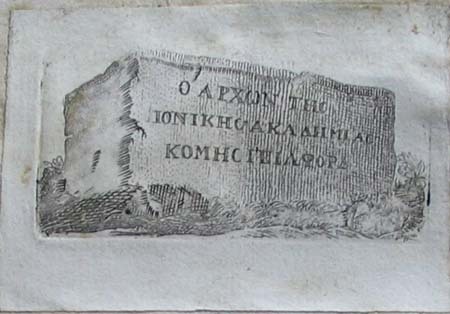 The Greek reads "O archon tes Ionikes Akademias Komes Guilford", referring to the Ionian Academy which he was instrumental in founding, owing to his lifelong philhellenism. Although the opening ceremony provoked ridicule due to the antique-style costumes designed by North himself, and in spite of the fact that the Academy was eclipsed by the University of Athens by the middle of the nineteenth-century, it was the first Greek University, and North promoted not just classical Greek culture but helped establish modern Greek as a language of education. His fascination with all things Greek had led him, earlier in life, to secretly become a member of the Orthodox Church. He later became an MP and the first colonial governor of Ceylon, before becoming involved in his Ionian project.